A great product for providing extra storage, plant/vegetable cultivation and seed propagation. Comprising of 4 individual shelves that can store plants and tools, allowing use in a limited space. 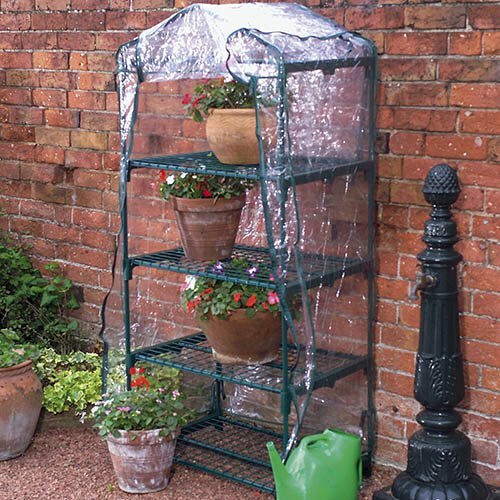 A clear PVC cover provides protection for plants allows sunlight to stimulate plant growth. The extremely sturdy steel frame can be dismantled quickly and easily when not in use. Supplied as an easy to assemble kit. This greenhouse is a great product for providing extra storage, plant/vegetable cultivation and seed propagation. Comprising of 4 individual shelves that can store plants and tools, its compact design will allow you to use it in any small garden or limited space. A clear PVC cover provides protection for plants whilst also allowing sunlight to shine through, helping to stimulate plant growth. The extremely sturdy steel frame not only increases stability but can be dismantled quickly and easily to put away when not in use.